With Christmas just around the corner, it's really time to start thinking about giving gifts to our loved ones - including our pets. 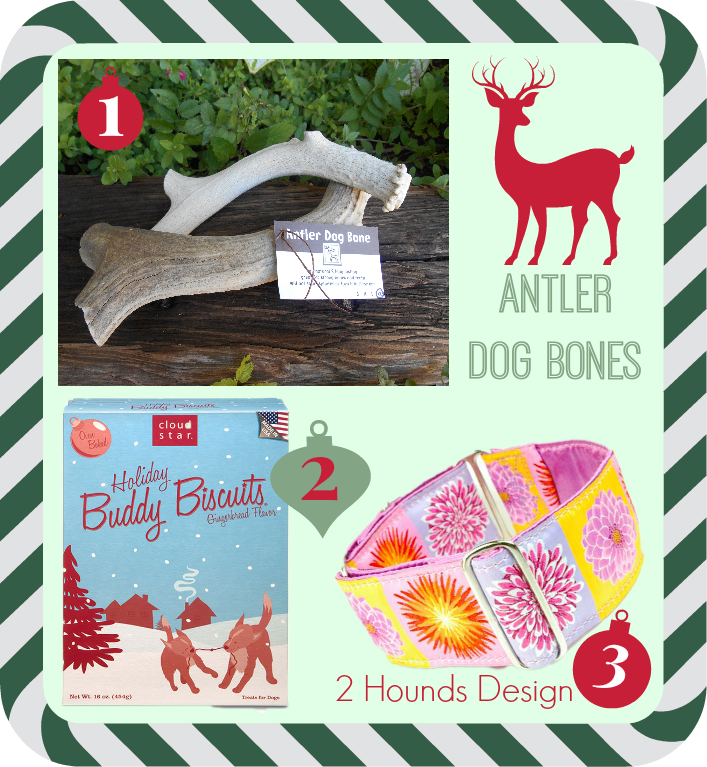 Throughout the month of November, we've shared some pretty cool gift ideas for pets and animal lovers. We'll be sharing a few more things during December too. To keep up with all the Black Friday stuff going on today, we're sharing some of our favorite gift ideas for pets and their people. It's a holiday wishlist for pets! What's on your pet's Christmas list? 1. Antler Dog Bones - We recently had the chance to try some all natural Antler Dog Bones from Peak Antler Company and loved them! They are long lasting chews for your dog straight from nature, plus no animals are harmed during the process of collecting antlers. The antlers are shed naturally by elk or deer in the wild. 2. Cloud Star Holiday Buddy Biscuits - Stay tuned for an upcoming review on Cloud Star's Holiday Buddy Biscuits. In the meantime, let's just say that these are great treats for dogs! We have recently become big fans of dog treats from Cloud Star and these gingerbread flavored dog treats are sure to be a big hit in your home this holiday season! 3. Dog Collars from 2 Hounds Design - Are you a dog collar addict? Stop by 2 Hounds Design and check out the HUGE selection of gorgeous dog collars available. Shiner has a dog collar from 2 Hounds Design and the quality is exceptional. 4. 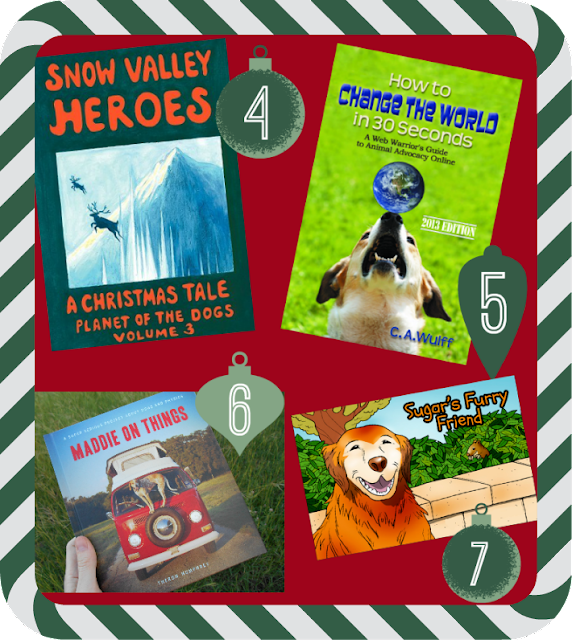 Snow Valley Heroes - This book is a perfect read that's sure to get your 6-12 year old child in the Christmas spirit. Great for adults as well. You can read our full review of this book here and enter to win a FREE copy for yourself! 5. How to Change the World in 30 Seconds - Any animal lover will appreciate this book. 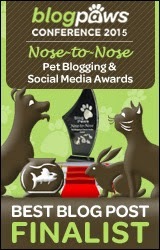 It gives tips on how to make a difference in the lives of pets online. 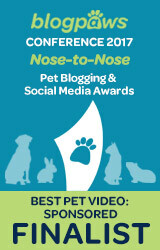 Highly recommended for bloggers who want to learn how they can more effectively advocate for animals online. 6. Maddie on Things - There is a copy of this book at our house and I just love looking at all the pictures in it. The idea behind Maddie on things is simple - Maddie stands on things. Things that I've never seen dogs stand on before. It's pretty funny. 7. Sugar's Furry Friend - This is a wonderful book for young children about Sugar the Golden Retriever and her furry chipmunk friend, Fred. The two of them experience the changing seasons together. My daughter read this book and really enjoyed it. 8. Drinkwell Original Pet Fountain - So I recently got one of these for our dog. I think it's a pretty nice little pet fountain at a great price. 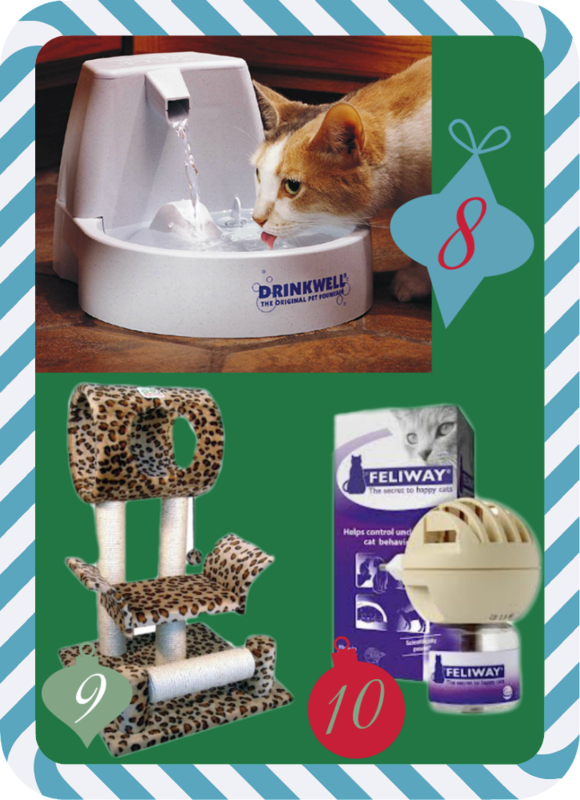 Most cats enjoy super fresh water and the Drinkwell pet fountain has a filter in it. 9. Cat Trees - What cat doesn't love a fun cat tree? This cute cat tree from Go Pet Club is leopard print with lots of places to scratch, lounge, and hide. If you shop around, there are all kinds of cat trees in many different sizes that are sure to accommodate your furry feline friends. 10. Feliway Plug-in Diffuser - The holidays can be a stressful time for some cats. Feliway diffusers are a natural way to help calm your kitty's nerves with all the hustle and bustle going on. You just plug them into your wall and they release a calming pheromone into the air, helping your cat feel more at ease. I also love supporting small businesses. The gifts at these places are unique and can't be found anywhere else, which I think makes them extra special. I love all the things that our friends Mollie & Alfie have at their gift shop. They are handmade items for both pets and people that are truly unique. Check out our review of Mollie and Alfie's Gift Shop here. 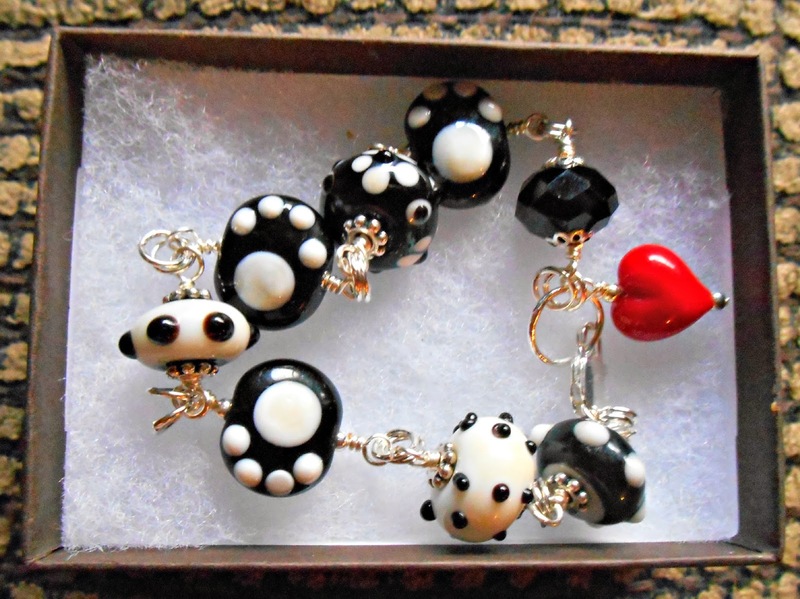 Another of my favorites is For Love of a Dog Jewelry. I recently won a bracelet from them and it's gorgeous! And they always have sales going on, so I highly recommend you sign up for their newsletter. Aside from dog jewelry, they also have horse and cat jewelry. If you're doing online shopping today or throughout the weekend, check out some of the links above. Don't forget to include your pet in all the holiday festivities this year - they're family too! Plus, it's fun to pamper our pets a little bit. Enjoy your Black Friday! Whoa! That leopard cat tree looks pawsome. *scribbles on list* Cool! Hey CK, you'd look fab in that tree! I haven't seen the split ones before. I don't think that the Peak Antler Company carries that kind. Those are some great ideas Ann. We have just about done all ours. Have a super Saturday. I have some catching up to do then Molly! Great ideas! We love Mollie's store......handmade stuff is so much fun. OMC, I've got to start writing my letter to Santa very soon! The kids have sent their letters already, I don't want to be late... If only I could make up my mind on what I want..
Well,currently celebrating Chanukah right now but am sure those celebrating Christmas will find this to be super helpful! We have read and reviewed 3 out of the 4 books, Cody hates fountains......and something else you featured we will be doing a give-away for THIS WEEK...stay tuned! We ADORE For Love of a Dog and have had give-aways for them and featured them and just ordered from them yesterday......they have Feliway at our vet and for cats like Cody who have no problems going to the vet it had no affect at all, I would be interested to read about how it works for cats that do have a problem at the vet. I am sure that many will appreciate this wonderful list! Well can't wait to see the giveaway Caren! I am so behind right now, trying to stay caught up! We used to use Feliway also, but not the diffusers. Those may be better for homes. 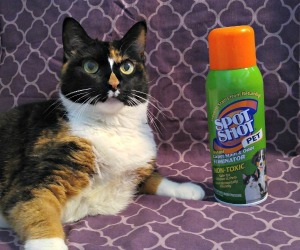 They have a spray that we would mist into the cages of upset kitties to help calm them down a little bit. Great gift ideas! :0) I bought one of those antlers from Peak Antler Company and Maya & Pierson love it. I love it too, because it is something they can chew on but not break. Very cool Dawn! Glad that your two are enjoying it! Very nice post! Love how you added the "small businesses". Great gift ideas! We will leave this on the human's screen to give her some ideas. Also, if we had thumbs, we would give six thumbs up to the Drinkwell fountain. We've had that one for about a year and we love it! It doesn't make any scary noises and it's easy for our human to keep clean so our water is always fresh. That's cool guys! I just got mine and haven't had it for very long, but I do really like it! Great ideas, all our shopping is now done just the food to get in. That's quite a list! Love that you support small businesses, too. We will definitely take a look at some of these things. Much love, The Scottie Mom. That means, we really love our pets! Hurray for all dog lovers and cat lovers, there are plenty of nice things to fill your bucket this holidays. Great list, Ann! I love to support other bloggers, so I just ordered some things from Mollie & Alfie's....I love everything I got! I also just ordered some jewelry from For Love of a Dog. She has a great sale going on right now. I really need to try the elk antlers with our dogs, I've been hearing such great things about them!